I Am Exercising & Eating Right, Why Am I Gaining Weight? Significant weight loss means making lifestyle changes that will last for the rest of your life, so it can be incredibly frustrating when it feels like your efforts aren't paying off on the scale. If you're doing all the right things but still gaining weight, consider a few minor lifestyle adjustments to avoid surprising weight gain triggers. Most importantly -- don't beat yourself up over it. That's not good for your emotional well-being and, ironically, the increased stress can make you gain weight. If you're gaining weight unexpectedly, it's time to audit your diet. Even healthy foods have calories, and you might actually be eating more than you think. It's normal to underestimate your calorie intake, especially when you're eating out or eating larger meals. Don't feel bad; even dietitians can fall prey to this weight gain trap, explains Brian Wansink, Ph.D., in an article published by Cornell University. Gauge the accuracy of "eyeballing" portions by plating a typical portion, then measuring it to see how much food you're really serving. You might find that "half-cup" of rice really approaches a 1-cup portion, or that "4-ounce" chicken breast is really more like 8 ounces. Don't criticize yourself for over-serving portions, if that turns out to be the case; just use it as a wake-up call. Then start measuring all your portion sizes before you eat and logging every food or drink you consume -- even water -- in your food diary. Simply adjusting your calorie intake might be enough to stop weight gain. If you're noticing unexplained weight fluctuations, try looking for hidden sodium in your diet. Sodium dissolves in your body fluids, and the more sodium you eat, the more your body will retain water to maintain a healthy sodium balance. That means eating salty fare can add a few pounds to your weight on the scale, seemingly overnight. Of course, fast and processed foods come packed with sodium. But look out for the sodium in bread, soup and broth, cottage cheese and other dairy products -- it can add up, even if you're eating healthy. You need just 1,500 milligrams of sodium per day to maintain your health, and you shouldn't eat more than 2,300 milligrams. Keep a tally of your daily salt intake in your food diary, and swap out salty-but-healthy foods for lower-sodium varieties at the grocery store to prevent water weight gain. While controlling your diet and getting lots of activity can help with weight control, overdoing it on dieting and exercise can undermine your efforts. Restricting calories slightly lowers your metabolism, and reducing your calorie intake too much can actually cause a semi-starvation state, because your body senses that it's not getting enough fuel. In response, it will resist burning any fat. You'll also start losing muscle tissue, which further lowers your metabolism and makes it harder to maintain your weight. This starvation state typically happens when you're getting less than half of your daily calorie needs, so, if, for example, you're burning 2,500 calories daily but only eating 1,200 calories, you're likely stalling your metabolism. Consult a dietitian for help getting your body to a healthy state; it might take some trial and error to figure out how many calories you need, and professional advice can help you minimize fat gain during the process. 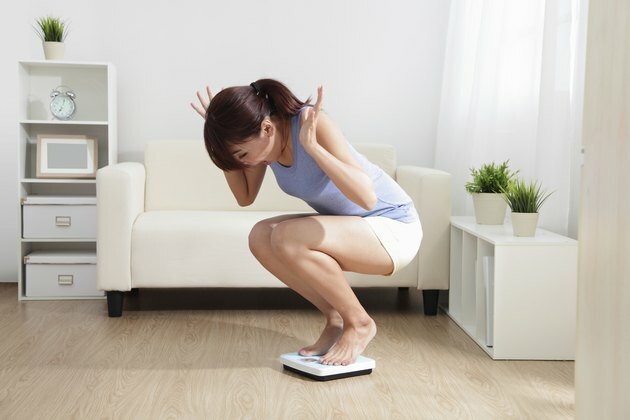 Obsessing over your weight, diet and exercise program isn't doing your waistline any good; increasing your stress levels can make it hard to lose weight, and even trigger weight gain. Normally, stress hormones play a role in your body's "fight or flight" response, and they help you access the fuel and energy you need to deal with a scary or stressful situation. Chronically high stress levels, however, disrupt your stress hormone levels. That affects how your body stores fuel, and you may find yourself developing more weight in your midsection. Let your food diary double as a stress journal, a place in which you note the most frequent stressors in your life, so you can develop strategies to reduce your stress levels. Writing down your thoughts, ending your day with a peaceful meditation or talking to a loved one can all reduce your stress levels, which may help your weight get back on track. Make sure you're getting enough sleep each day, too; sleeping 7 to 9 hours a night helps normalize your stress hormone levels, while sleep deprivation increases stress hormones. Certain healthy conditions, like hormonal disorders, can make it hard to lose weight and easy to gain -- even if you're doing everything else right. For example, polycystic ovary syndrome, or PCOS, is often associated with abnormal testosterone and stress hormone levels, which make it harder to lose weight. And the low thyroid hormone levels associated with hypothyroidism stall your metabolism, so you gain weight very easily. If your struggle with weight stems from a medical disorder, treating the underlying condition may help.